The Bakker Elkhuizen Ergo-Q 330 Notebook Stand and Riser is budget friendly and makes laptop use ergonomic without negating the computer's portable capabilities. This compact, adjustable and foldable notebook stand angles your laptop to a comfortable viewing height and offers an in-line document holder to help ease the work process even further. 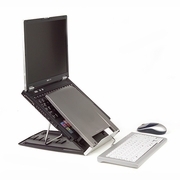 The use of this Ergo-Q 330 Notebook Stand requires an external keyboard and mouse (not included).